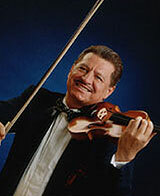 János Csikós, Hungarian violinist, is the youngest child of a remarkable musical family. At the age of six, János, having received a violin from his father, became a gifted violinist. He attended the Budapest Conservatory where he studied violin and composition under Professor Zaturecki, obtaining excellent results and high musical qualifications. Since finishing his studies he has performed at many prestigious theaters, including The Munich Opera theatre with the famous Marika Rök. In Stockholm he had the privilege to play for King Gustav Adolph and his family at Sweden's Royal Palace, and became known as "The Gypsy Baron". János performed in Athens, New York, and in Antwerp in presence of her Majesty Queen Fabiola.